The goal of this article is to address most of the questions or concerns you're likely to have about spiral stair products, their uses, their advantages, and any other major concerns in order to ease you along in your decision making and purchase process so that you find a stair that represents the perfect match for your needs and space. 10. Why Salter Spiral Stair? 1. What measurements do I need to start my project? The most important measurement that you’ll need to know for how to build a spiral staircase is your finished floor to finished floor height. Every stair is custom built to fit your space and an accurate floor to floor height is the first step to starting your project. Your finished floor-to-floor height will determine how many steps, or treads, are in your stair and the rotation of your spiral stair. You can measure your floor to floor height by starting at the bottom floor where you will be installing the stair. From here, measure up to the finished floor and include any sub flooring or carpeting for the most accurate measurement. Some of our customers take our DIY spiral staircase lines and choose to install their spiral stair through a hole in the floor that leads to the upper floor. If this is the case, you will need to know the size of your well opening, or the opening for your round staircase. The size of your finished well opening needs to be at least two inches larger than the stair’s diameter. This is because your stair needs to fit comfortably through the hole so that your fingers do not get pinched as your hand glides along the handrail as you ascend and descend the stair. Whether you decide on a square or round well opening, the measurement will be the same. Please keep in mind that the smallest well opening we can work with is 44 inches x 44 inches; this is because the smallest stair diameter that we offer is 3 feet 6 inches (which is 42x42 inches). If you have a well opening smaller than 44”x44” our consultative designers will work with you to find the best solution for your spiral staircase. While the floor to floor height of your spiral stair is the first measurement you need, knowing your preferred diameter can be useful as well. Diameter is just the width of the stair. Your diameter may be defined by the staircases’ surroundings. For example, if you want a loft stairs kit and you’re attaching your spiral in the corner of your home to gain access to a loft, think about how much space you have available for your staircase. If you’re unsure about the diameter, our consultative designers can help determine the right size stair for your project. 2. How should I select a spiral stair diameter? At Salter, the smallest stair diameter we offer is 3 feet 6 inches which translates to a 42” x 42” diameter. If you are going through a hole in the floor your finished floor opening should be two inches greater than your stair’s diameter. For example, if you are using a 3’6” spiral stair to get you access to an attic through a hole in the floor then you would need a finished floor opening of 44 inches x 44 inches. The extra two inches ensure that you fingers will travel freely and unhindered as you walk up the spiral stair. Matching the floor opening to the exact measurement of your stair’s diameter would cause your fingers to pinch while using the handrail. For more information on finished well opening sizes please refer to question #1. While going through a hole in the floor is a common application for spiral stairs, many of our customers install a loft stair kit at the face of a loft or deck. If that is the case you will want to think about two things: your desired clear walking space and whether or not you want to meet building code. When we talk about “clear walking space,” we are focusing on the physical area you have to walk up and down the stairs. One of the major benefits of a spiral staircase is the large surface of each step in a small space. This amount of clear walking space is determined by your stair’s diameter. Starting at a 3’6” diameter, your clear walking space will increase by 3” for every 6” of additional diameter. It can be hard to envision these measurements without physically seeing them. A quick trick to seeing your clear walking space is to use a sliding door in your home. Slide open your door to match the clear walking space for your diameter. For instance, if you choose a 3’6” diameter, open your door exactly 17”. This 17” represents the clear walking space you would get with our smallest 3’6” stair. Use the chart above as a guide to determine what the most comfortable walking space is for you and your guests. This can help you narrow down your diameter measurements if you’re having difficulty. Your measurements may be defined by your staircase’s surroundings. If you need a smaller stair with a 3’6” or 4’ diameter, you will have a smaller clear walking space, but it is still complete safe to use. This is because the structure integrity of our stairs does not change with diameter size. 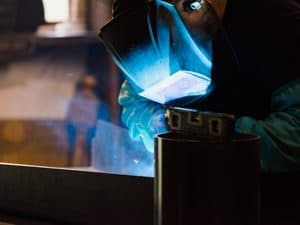 We stand behind our build and offer a lifetime warranty on all welding and fabrication. If you have a larger amount of space for your spiral staircase, you can choose to install a larger stair that will provide a more clear walking space. Generally speaking, a stair with a diameter of 5' or larger is going to be very comfortable for your application. Spiral stair building code requires your stair to have at least a 5’ diameter. Our 5’, 5’6” and 6’ code package stairs will meet code in many states across the nation. Now that you know a little more about spiral stair diameters, check out our building code page to learn more about code requirements of your spiral stair. If you have any additional questions about your stair’s diameter or building code, call one of our consultative designers at 1-800-368-8280 for instant answers! If you need help with your measurements, one of our expert designers can walk you through every step of the process. Request a consultation, or contact us directly at 1-800-368-8280. 3. How much space does a spiral staircase require? One of the first questions that homeowners have when considering a spiral stair is, “How much space will I need to install a spiral stair. There is not set space requirement, it all depends on your unique space needs. Your spiral stair’s footprint is another way of saying the amount of space the staircase will take up in your home. Because your stair’s diameter is the total width of your stair, it will also determine the footprint. The smallest spiral stair diameter that we offer is 3'6”, which translates to a 42” x 42” footprint. From here, the footprint will increase in 6” increments like the diameters. Determining your spiral stair’s footprint can help you find the best size spiral staircase for your design. Often times, a customer wants to tuck their spiral stair into a corner against the wall and isn’t sure how much space they truly have for their stair. If you think a 3’6” stair is the right fit for your space, mark a 42 inch by 42 inch space on the floor with tape. The area that you mark will essentially be the footprint of the stair and it will give you an accurate idea of how the stair will fit in your space. Please remember that 42x42 is our smallest diameter and we do offer larger sizes including 4’, 4’6”, 5’, 5’6”, 6’ and larger. If you’re between a few different diameters, mark off a few different sizes to find what best in your space. For any additional questions, feel free to call one of our consultative designers at 1-800-368-8280. They can help you find the best stair for your space and help you through the entire design process. 4. How much does a spiral staircase cost? When customers are looking to buy a spiral stair, their first thought is often “How much does a spiral stair cost?” Spiral staircases are often associated with grand entrances and expensive spaces. However, there are plenty of designs that fit into a wide range of budgets. Because there’s a large number of customizable options that will affect spiral staircase prices, it’s hard to give you a specific number. We’ve broken down the major price points for you here! Spiral staircases prices come in a wide range from $600 through $100,000. For the purpose of this discussion we will limit the range from $600 to $20,000. Here at Salter Spiral Stair, the quality is consistent throughout all of our products. The more expensive stairs don’t have a longer warranty, nor are they manufactured using a different process. The same Pennsylvania craftsmen that build our $20,000 stairs are the same people building our $600 stairs. For pricing specific to your needs, please provide your project details in our short pricing request form. The two major factors that determine your spiral staircase prices are the size and level of customization in your spiral stair design. For example we offer the smallest size diameter (3’6”) in a nine tread package for around $600. This is a quality carbon steel stair primed black with adjustable sleeves, but without any additional design options. Our stair designs range from this basic model all the way up to a three story Aluminum Powder Coated spiral stair with a 6’ diameter that cost up to $20,000. Each category of spiral staircase offers its own benefits. The high cost of the Aluminum Powder Coated stair mentioned above is determined by a few different features. Starting with the basics, the raw material costs for an aluminum stair are going to be higher than a carbon steel frame. With this cost comes the added benefit of a rust resistant spiral stair frame. The powder coating finish on all of our aluminum stairs adds to the cost, but provides the extra benefit of a protective barrier between the stair frame and harsh weather. Now the size of the stair increases the cost in two ways. Because of the very large three story height of the stair, it will cost more than you’re standard one story staircase. It is essentially three staircases that are connected to create one large design. The larger 6’ diameter increases the amount of material and workmanship and in turn spiral staircase prices. Code compliant stairs also have extra safety features built into the design. For instance, there are extra balusters, or spindles, as well as risers that close off the open space between each step. In order to meet code, there should be no space large enough to allow a 4” sphere to pass through. While Salter Spiral Stair has plenty of added features for your spiral staircase, we also provide many of our unique features at no extra cost. We want to work with each customer to design a staircase that will fit their ideal design and budget. Our stair experts can take you through each step of our consultative design process including a free digital rendering for your custom spiral staircase design. 5. What are the different types of spiral stairs? Spiral stairs can fit into two major categories: indoor and outdoor designs. One of the first questions our stair designers will ask is whether the stair is going inside or outside. If you stair is going indoors we want you to have a stair which not only meets your space requirements, but also a stair that is aesthetically appealing. If you have an outdoor spiral stair project, then we want you to have a stair that looks great and withstands the harsh outdoor elements. Our two outdoor product lines last for 75-100 years outside and they will withstand rainy Seattle days, bitter-cold winters in New England, salty-air on the New Jersey shore-line and the oppressive sun of the Arizona desert without an ounce of rust! For indoor applications we recommend our Classic Steel, Solid Wood, and Forged Iron product lines. Our best selling indoor spiral stair is our Classic Steel product line. Of the staircase kits, it’s a cost effective option that also has lots of flexibility in the design. For example, we offer a large variety of customizable options, including decorative spindles and different handrail options. Your Classic Steel stair can truly be as simple as you want or as custom as you want. As always, if you have design questions or if you’re interested in our design options please contact one of our stair designers today! For a traditional piece that will add elegance to your home, our Solid Wood spiral stair the perfect solution. We custom build all of our Solid Wood stairs to your specification at our factory in Collegeville, Pennsylvania. Salter’s in-house wood department features expert woodworkers with a combined 75+ years of woodworking experience. When we say “Solid Wood” we really mean solid wood! There is no metal used in any part of our wooden staircases. Be wary of other manufacturers who offer “wooden” stairs with a steel center column. Similar to the Classic Steel line, Salter’s wooden spiral stairs offer many different custom options. Our Forged Iron spiral stair is the perfect addition to a Traditional or Victorian style home. Known for its ornate details, the different decorative balusters are grouped together to create complimentary patterns. When paired with solid wood tread covers and a handrail, your Forged Iron spiral stair is elegant and the perfect complement to your home’s design. If you have an outdoor project that calls for a spiral stair we recommend Galvanized Steel or Aluminum Powder Coated spiral stair. Salter’s Galvanized Steel spiral stair is a cost effective stair solution that is built to last. A set of galvanized spiral stairs will last you 75-100 years outside with zero maintenance. Our hot dipped galvanizing process gives the stair a weather proof finish meaning your first cost is your only cost. During the hot dip process, the zinc coats the entire stair and covers the corners and other nooks and crannies on the stair where corrosion usually begins. The galvanized finish gives your stair a metallic silver finish. Galvanized spiral stairs will weather over time giving them a “battleship grey” appearance. After the stair is fully weathered, you can paint your spiral stair with the proper primers and paint products. This will take about six to nine months. Salter Spiral Stair’s Aluminum Powder Coated spiral stair is the perfect stair solution for an outdoor space with a focus on design. We enhance the already rust resistant aluminum stair frame with our powder coating finish. This gives the stair a maintenance free finish, much like the Galvanized Steel spiral stair. Not only does it help your stair to last, but it also comes in custom colors. Often times, customers like to powder coat their stair to match a deck or exterior home decor. In addition to custom powder coating, aluminum stairs also look great with tread covers to match your decking. Be sure to ask you Stair Design Consultants about all of Salter’s options for aluminum spiral stairs! If you need help choosing the right material and product options for your project, one of our expert designers can help you. Request a consultation, or contact us directly at 1-800-368-8280. 6. What determines how my spiral stair rotates? When people think about spiral stairs, they picture a full spiral. However, not every spiral stair completes a full rotation! The rotation of your spiral staircase is dependent upon your finished floor-to-finished floor height. While every Salter spiral stair is custom made to fit your space and design dreams, this example will use a code compliant staircase. Spiral stair building code calls for 30 degree treads. This means that each tread rotates 30 degrees around the center column. After you’ve found your floor to floor height, your consultative designers can help you find the right number of individual steps on your staircase. Take this number and multiply it by 30. For instance, if you have 12 steps, or treads, you will have a full 360 degree rotation. Once you’ve measured your floor to floor height, call one of our consultative designers find the number of steps that will work in your space. All you need is one measurement to start your project! If you have your measurement but no time for a call, fill out our quick form on the Request Pricing page. You can give us your measurements and some basic facts about your project. Our consultative designers will call you at a time that's convenient for you. 7. How easy is it to install a spiral staircase? Installing your own spiral stair may seem like an intimidating task, but our DIY spiral staircase lines make it an easy weekend project. Once your spiral stair is ready to be shipped to your location, our shipping company will call to schedule the best time for you. We ship our stairs in kit form meaning all of the individual parts of your stair are broken down and wrapped to make shipping and handling easier. Once you have all of the parts laid out for installation you are ready to begin the process. Your spiral stair goes together like a large erector set with the help of a spouse, friend, or neighbor. Our customers range from experienced contractors to do it yourself homeowners, but they all can install their spiral stair themselves. Our Featured Projects page features actual Salter customers and their experiences with our installation. Most spiral staircase kits can be assembled in a weekend by two people using easy to follow directions, and no special tools are required. 8. How do I know what I’m buying will actually fit my space? When you’re buying something as big as a staircase, you may be nervous about our designers never seeing the physical space. Our stair experts are dedicated to making sure your dream spiral staircase will fit your space perfectly. One way we ensure the right fit for your space is using AutoCAD as a part of our design process. AutoCAD is a computer program that allows our designs to produce a digital rendering of your spiral stair in your space. We work off of your pictures, measurements, and anything else you can give us. Once we have a picture of your space we will do an online design meeting with you and show you how your stair will be custom built for your space. We do not give you a generic stair that may or may not fit your space - we build your stair your way and let you pick all of the options. You can watch our designers draw your stair live from home right on your computer screen. Once we are both satisfied that the design meets your needs, we will send the design to the shop where everything is cut and fabricated to your exact specifications. Our unique consultative design process gives our customers a one of a kind customer experience. Don’t just take our word for it, see what our customers have to say on our Featured Projects page. 9. Do I need to meet building code requirements? Depending upon your space and project, your spiral stair may not have to meet building code. Our stairs’ safety is never in question, whether you choose to meet building code or not. In other words, the structural integrity of your stair remains the same regardless of whether you choose a code stair or non-code compliant spiral staircase. If your spiral staircase is the only means of access to an area of your home, you will need to meet building code. One example of this would be if you decided to replace old basement stairs with a newer and more stable spiral staircase. Because it will be the only way to access your basement, it will need to meet building code. Many of our customers install a spiral staircase in a home that they are preparing to sell. For example, if you are installing a spiral stair on a deck in your backyard and you plan on selling to home soon then you can expect an inspector to come out and look at your stair. In this case, you will want a code compliant stair. There are some cases that you may not need to meet building code. If your spiral stair is a second means of access, you may not need to meet building code. For example, if you already have a code compliant stair leading up to the second floor of your house, but would like a smaller secondary means of access in a corner, your spiral stair will not have to meet building code. You will not need to meet building code is you are providing a safer and better means of egress to a floor. For example, let’s say you want to replace your attic stairs and a spiral staircase. For the purposes of this project you may not need to meet building code because you are providing a better and safer means of egress to that attic. While this is a case in which you wouldn’t need to meet building code, every municipality has different requirements. Check with your local code officials to be sure that this is the case. If you don’t plan to sell your home or you plan to pass it down through the family, you may decide not to have an inspector come out to the house. In this case, you won’t need to meet building code. The home won’t go through a formal inspection. You might also choose a non-code compliant staircase if you simply do not have enough space for a code stair. Remember, building code requires a 5 foot diameter stair. A 5 foot diameter stair has a 60 inch x 60 inch footprint and some customers do not have enough space to accommodate a 5 foot diameter stair. As we mentioned before, code and non-code stair do not differ in their structural integrity. These are just a few example scenarios of when you might choose to meet building code or choose a non-code compliant stair. Many homeowners are unsure of building code requirements and whether a code compliant stair is needed for their project. If you have any questions about spiral stair building code and how it relates to your design, call one of our consultative designers! They can answer all of your questions within minutes. 10. What makes Salter different from our competitors? Since the beginning in 1979, Salter Spiral Stair’s concern has always been our customers and their designs. Our goal is to work closely with each customer through our consultative design process to create a unique spiral stair design that will fit into their design dreams and budgets. Large retailers won’t provide our level of customization, while our smaller competitors can’t match our product features. Each spiral stair is custom built to your specifications by Pennsylvania craftsmen. We do not have an “off-the-shelf” generic product that many of our competitors offer. Salter Spiral Stair builds your staircase based on your wants and needs for your space. We also offer the very best consultative design process in the industry. Our testimonials page is filled with actual Salter customer stories about the design process, installation, and their Salter experience. We understand that each customer wants to find the best value for their home. When you call our consultative designers to get pricing on your spiral stair, remember that it cannot be compared to those of our competitors. The build of a Salter spiral stair compared to others is one that will hold up over time and give you the best value. When you purchase a Salter spiral stair, you’re not only getting a staircase for your home, but also the support of our consultative designers and customer service representatives. We want you to have and enjoyable experience through every part of the process, from the first phone call to your installation. If you find that Salter Spiral Stair is the right fit for your project or simply have more questions, call one of our consultative designers today at 1-800-368-8280! You'll get quick and accurate pricing plus our expert designers can design the perfect stair solution based on your requirements and budget.